Choosing a vet for your cat is an important decision that will affect your pet's health and happiness for years to come. The key is looking carefully at the clinic itself and examining how the staff interact with you and your kitty. People always ask me, "How do I find a vet?" Then they ask, "How do I know they are good?" I myself have had to change vets in my 28 years of owning my pets - sometimes because of a move, but more often than not it is because my needs change. For example, I had a dog that needed special knee replacement surgery, therefore I needed a surgeon that specialized in knee surgery. I personally prefer to have a wonderful all-around vet who has an amazing staff and team. Their offices are always clean and he has updated new equipment. He tends to be on the cutting edge, but also practices with some eastern philosophy. And if and when I need a specialist, my vet works very closely to help me find the right one and the correct fit for me and my family. This is all very important when picking your vet. Ask friends, family, co-workers, and if you are a member of a religious organization, that is a wonderful place to ask also. Here are a few things to look for. The best way to choose a veterinarian is the same way you pick your child's doctor - pay them a visit. Call ahead, don't bring your pet, but tell the staff you would like to drop by and introduce yourself. 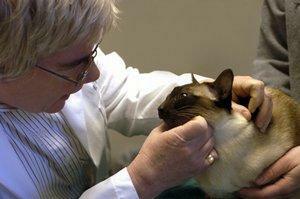 For a start, ask some of your pet loving friends which veterinarians they recommend. If you don't have enough pet-owning friends or are new to the area, then call your humane society or a few local kennels and catteries. As a rule, veterinarians pull their clients from within a five-mile radius. If price is a concern to you, select a veterinarian practicing in a blue-collar area. Call up the veterinarian's office midweek and ask to introduce yourself on the telephone or in person. If you are told that "Dr. Bones is in surgery," ask for him/her to call you back when they can. The office condition is a good clue about your veterinarian's priorities. Are the rooms clean and free from odor? Are instruments and equipment arranged methodically or laying about? While you are waiting in the reception room, notice the items on display. Is your vet active in social and community organizations? If the only things on display are plaques from the Better Business Bureau, the local veterinary association and a notice that payment is due upon exam, these are not encouraging signs. If you do not like the receptionist's attitude, you have a good warning sign. How she can help you? While you wait, notice her telephone skills and demeanor. Too many auxiliary staff often means that the veterinarian is trying to maximize the number of clients seen in a day. In that case, you will find yourself spending very little time in actual conversation with the veterinarian. See your vet one to two times a year for a healthy check up and yearly shots. Set an appointment with the veterinarian you choose for a healthy physical examination when nothing is noticeably wrong with your pet. Engage the vet in conversation until you get to know his/her style with you and your pets. By the way, bring in a single pet - not a carload. It is always nice to bring a friend, be it a loved one or just a friend. It helps to have a second opinion accompanying you, and especially when you are in a stressful situation with a sick pet. It's always best to set up an early morning appointment. I like this because the staff and the Vet are fresh and if you need to leave your pet, with any luck, it will be just for the day and not overnight. For overnight stays, your vet should have clean large kennels in back, with 24 hour supervision, and you should be able to call at any time to check on your cat. Write down your questions for the vet in advance. And remember to ask questions when you do not understand. Your vet (as well as the staff at the vet's office) should always be happy to answer any and all questions. Discuss the costs for a full understanding of billing before you go in. There are flat rate costs for a wellness visit, yearly shots, and worming. Some vets today take pet insurance, and others offer payment plans. Be nice - I find in life in general, I get further with honey than vinegar. When you're nice, friendly and outgoing, people tend to respond back the same way. This can only help you if you have an emergency, and they think "Wow, Mrs. Jones is always so nice, but she sounds very stressed and scared right now, so let's try to help her." Go for a wellness check, rather than an emergency. Do they offer 24-hour emergency care after hours? Does the vet have good bedside manners? Do they take pet insurance? What are the office visit costs? Are they friendly and informative?